Coat glassware baking dish with olive oil spray. In a medium mixing bowl, mix 1/4 cup grated Parmesan, 2 tbsp lemon juice, 1 & 1/2 tbsp Spectrum Canola Mayo, a pinch of sea salt, 2 tbsp diced scallion, & 1 teaspoon Sriracha. 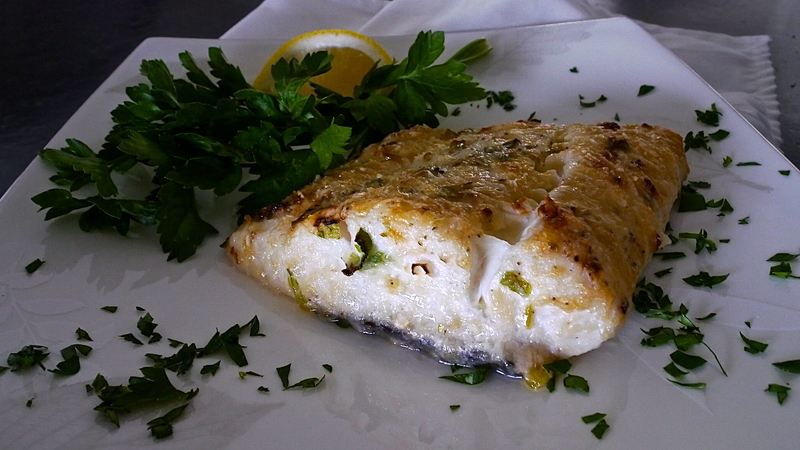 Place the halibut fillet centered in the glassware baking dish. Place in oven & bake for 10 minutes. Spread the mixture of ingredients evenly on the 3 exposed sides of the fillet. Continue to bake for an additional 4-5 minutes, or until lightly browned. Spray the glassware cooking dish with olive oil spray. Slice 3 medium-size red skin potatoes into thin, 1/4 inch slices. Add 1 & 1/2 tbsp olive oil & 1 teaspoon minced garlic to a medium mixing bowl. Add the sliced potatoes to the mixing bowl, & evenly coat with the oil & garlic. 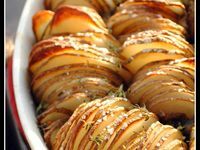 Neatly arrange the sliced potatoes, placing the edge of the next potato on the potato that was placed before it, creating a slight layered effect. Evenly top the first layer of potatoes with 1/2 of the 1/4 cup of Parmesan, & 1/2 of the teaspoon of minced garlic. Create another layer upon the first layer, & top with the remaining Parmesan & garlic. Top evenly with the 1/2 teaspoon of dried thyme. Roast in the oven for 45-50 minutes, or until golden & crisp. Fill cooking pot with water, two thirds of the way, & bring to a boil. Add 2 cups broccoli, & lower to medium flame/temperature. Steam for exactly 1 minute. Drain the broccoli in a strainer. Evenly top with 2 tbsp lemon juice, 1/2 teaspoon minced garlic, a pinch of grated Parmesan, & a drizzle of olive oil . Halibut is a delicious yet mild fillet, and is one of my favorites. This delicious recipe may be enjoyed for Meals 2 or 3 on the Remedy Recipes format, however to use it for Meal 4, simply remove the potatoes. We hope that you enjoy this tasty recipe. It’s best hot-out-of-the-oven, so be sure to coordinate your timing. The Parmesan, garlic, & herbs lend some amazing flavor, as does the Sriracha-mayo topping! This is another great option for Fridays during LENT. Have a Happy & Blessed Easter, & a Blessed Passover.